Overseas Collections till Monday $11.2 Million or Rs 76.16 Crore gross. Dangal is estimated to be made on a budget of 125 Crores all inclusive also. 50 crores is estimated as a salary for Aamir Khan. Dangal is releasing on more than 4300 screens across India inclusive of around 100 screens each in Tamil and telugu . In Overseas Dangal is releasing in close to 1000 screens with widest release in North America, UAE, GCC , UK and Australia. 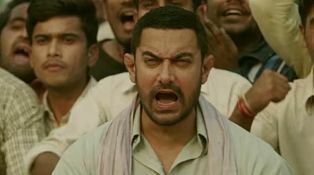 Dangal is well budgeted movie and most of the investment is already recovered and will be considered a hit if it crosses 130 Crores at the box office. Dangal has a record sale of satelitte rights for close to 75 Crore to Zee TV this is the highest ever amount paid for a hindi movie. Minimum Sale value is 55 Crores and rest 20 Crores will come if the movie crosses 100 Crores and 200 Crores mark at box office.